Should President Trump’s Evangelical Advisors Resign? CRN has reported that some of President Trump’s spiritual advisers are anything but authentic Christians; they are Word of Faith health and wealth prosperity preachers, which qualifies them as false teachers…wolves in sheep’s clothing. One such adviser to the president is his close confident and “pastor” Paula White. White is also the “spiritual daughter” to anti-triniterian prosperity preacher T.D. Jakes’, as you will see here. During a recent interview with Pastrix Paula, another word-faith wolf, Jim Bakker, proclaimed that this woman has “full access to the White House anytime she wants,” as she sat there nodding and grinning. 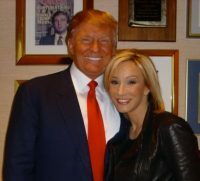 So if some members of Trump’s “evangelical” advisory council feel they must resign, let’s cross our fingers that Paula White will be one of them. President Donald Trump & Paula White. People are certainly divided over their support for President Trump. This division is not only seen in the country in general, but even within the Republican party, and also within the Christian community. Trump created his Evangelical Advisory Board–a group of evangelical pastors and Christian leaders who are there to give him advice–during his presidential campaign. The Evangelical Advisory Board includes such prominent Christian figures as Liberty University President Jerry Falwell Jr., Pastor Robert Jeffress of First Baptist Church in Dallas, Texas, Pastor Paula White of New Destiny Christian Center in Apopka, Florida, and Christian author and speaker Johnnie Moore. Recently, some members of this advisory council have been considering stepping down, due to what they see as a disconnect in values between themselves and the President. Pastor A. R. Bernard, one of Trump’s advisors, actually did step down, and explained his reasoning here.